The Ca' del Dose is a small, family-friendly guesthouse near the Riva degli Schiavoni, a waterfront promenade with many of Venice's leading luxury hotels. Its 10 air-conditioned rooms are decorated in a traditional Venetian style and offer free Wi-Fi. If you like church bells, you'll enjoy the Ca' del Dose: It's just around the corner from the Chiesa San Giovanni in Bragora, where Pope Paul II and Antonio Vivaldi were baptised. As you leave the Alilaguna Linea Blu airport-boat pier at Arsenale, turn left and walk along the water. Cross the bridge in front of you. Continue walking straight ahead, past the Hotel Gabrieli Sandwirth and other large buildings that face the waterfront. Turn right at the Calle del Dose, a narrow street just before a large red stucco building with a small clock on the right corner of its façade. 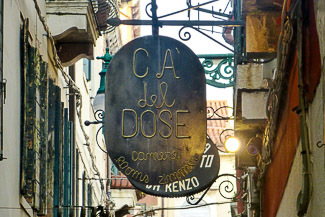 The Ca' del Dose will be a few doors in on your right, with an oval metal sign overhead. Leave the terminal by the main doors and walk to the wooden bridge. Cross the bridge and walk a short distance to the vaporetto station. Take the No. 2 vaporetto (water bus) in the direction of San Zaccaria. Get off at the Zaccaria stop, turn right, cross the stone bridge, and continue walking along the waterfront until you reach the Calle del Dose. Turn left and walk a few meters to the hotel.